I was fortunate enough to be able to ask Goblinworks' Ryan Dancey (Eve Online, Dungeons & Dragons) and Mark Kalmes (City of Heroes, World of Darkness) about their PATHFINDER ONLINE Kickstarter. One thing I didn't realise - and that may have just been me being slow on the uptake - is that the Kickstarter isn't to fund the game; it's already funded. The $1,000,000 Kickstarter is to accelerate the process. With four days to go and $300,000 to go, it's going to be a tight race to the finish line! Over the last couple of weeks, the Kickstarter rewards have been growing daily. From miniatures, to PDFs, to core rulebooks, to in-game items, not a day goes by without a new item being added to one of the reward tiers. Paizo and Goblinworks are making an Herculean final push towards that goal line - they've been featured in Forbes, The Escapist, PC Gamer, and more. I asked them not only about the game, but the Kickstarter process itself. Morrus: OK, so you've answered this question over and over - in interviews, on the Kickstarter page, and so on. But there may well be those who don't know yet. If you were to succinctly describe to someone why the Pathfinder MMO is better than the many alternatives, what would you say? Ryan: It's a fantasy sandbox - that means that your actions are persistent and the primary way you engage with the game is by meaningfully interacting with other players as opposed to content created by the developers. You'll get an intense sense of immersion from seeing the stuff you make and build have a real, lasting impact on the world shared with thousands of other players. Mark: Having player actions affect the world is our first goal, rather than the last. You'll be able to build player cities and castles from day one. You'll even be able to affect the monsters in the environment. Morrus: Is it really possible to make a "no-grind" MMO? How are you going to do it? Ryan: I'd define "grind" as doing things you don't want to do over and over for a long time to get a fairly minor positive reward. We want to make the players interacting with each other drive the action, so that everything you do is meaningful to someone (and likely to you as well). You may do some things a lot, but you hopefully won't feel like you're doing them pointlessly. Mark: Pathfinder Online uses time-based experience. You aren't forced to hack up one hundred wolves in order to proceed in the game. How you interact with the world is up to you, but we aren't interested in inserting grinds into the experience. Morrus: How much will the MMO resemble the Pathfinder RPG? Are we talking "using the Pathfinder name and art style" or "porting the mechanics into the game"? Ryan: The mechanics will be different but similar in many ways. Someone who plays the tabletop game should have an intuitive grasp of how many parts of the game work; that said, the tabletop game focuses on small groups of heroic adventurers, and the online game has a vastly expanded scope; dealing with characters who are diplomats, engineers, crafters, spies, explorers, soldiers, etc. So there will be a lot more to the game than just encounter combat mechanics and much of that has to be built for Pathfinder Online because there's no direct analog in the tabletop game. Mark: We'll be taking a lot of inspiration from the tabletop game, but making sure the rules work in an online environment. For instance, we know we have to have ability scores, but we want to make sure they don't limit you. Morrus: Will combat be point and click like Warcraft, or more twitch-reaction a la God of War? Ryan: We're not making a game where player click speed or ability to aim will be relevant. There are technical limits in doing an MMO that make such things difficult, and we don't like the tradeoffs. The game will focus attention on your selection of options, the way you use those options, and how you make choices during combat, so it won't be as simple as picking a target and button-mashing a macro. Mark: We will include a lot of tactical choices in combat, so that the correct choice of skills and when to apply them will be important to gaining combat advantage. But we will not be focused on click speed or fine mechanical skills. We want to make sure the game is playable by a wide range of people. Morrus: What about storyline? Can we expect meaningful, story impacting choices instead of collect 10 'X' or get a 'Y' and take it to 'Z'? Ryan: There's a story that we are plotting that the players will see; it's more of a thread of events and encounters that slowly weave together over time to reveal one of the mysteries of the setting - what happened to the town of Mosswater. There will be game systems that generate content almost procedurally. Small incursions of monsters if left unmolested will "escalate" becoming more dangerous. Sometimes when you deal with the initial appearance of a creature type, that unlocks escalations that lead through a series of events that culminate with a meaningful conflict with powerful foes. But the biggest source of content will be the players asking each other to help, and players trying to stop others from achieving their goals. One level of this is territorial control; the battles between Settlements for Hexes. But it has many levels like harvesters dealing with bandits, or teamsters dealing with robbers. People who are crafters need resources and paying other players to get them is a meaningful part of game play. Every chance we get, we're going to look for ways to put groups of players in conflict with each other, and give players benefits for interacting with each other. That's the real heart of the storytelling. Mark: . Impacting the story line is a big element of our plans. We're going to make sure that if you kill an orc chieftain, that chieftain stays dead, and people in the community know exactly who killed him. Morrus: I notice that the MMO is a subscription-based game: a model which seems to be becoming less common these days in favour of free-to-play games featuring micropayments. Do you feel that a subscripton-based game can be competitive in that market? Ryan: We are going to have a hybrid subscription / microtransaction game in the same way that Turbine supports Lord of the Rings Online and Dungeons & Dragons Online. During Early Enrollment, we'll be subscription only, but that's to keep things simple as the game expands. We'll offer microtransactions as soon as we can. Mark: We'll be implementing a hybrid subscription model, which is working well for many games. How exactly the microtransactions and subscriptions interact we will have to polish and tune later in production. Morrus: What happens if the Kickstarter fails to reach its $1,000,000? Will you try again, look for alternative means of funding, or cancel the whole project? Ryan: The game is financed and in production. The Kickstarter lets us speed up the time to develop it. We are focused on getting the Kickstarter across the funding goal and we're not making "what if" plans. Mark: We don't have any particular plans made yet for the case where the Kickstarter fails to hit its goal. We are optimistic that we won't have to worry about it. Morrus: There was a previous Kickstarter, which was for a technology demo to show to potential investors. You asked for $50K and got $300 -- did you manage to get those investors, or is the Kickstarter in lieu of them? Ryan: Yes, we were successful. As a result of the Technology Demo Kickstarter and successfully building the Technology Demo on spec, our backers have greenlit production of the game. Mark: Yes, we have investors that are funding the development of the game currently. Morrus: You have announced a number of exciting rewards, from miniatures to the Emerald Spire megadungeon being authored by a plethora of industry veterans. Will these things be available separately? Ryan: Currently we're not making plans for them beyond the Kickstarter. After the Kickstarter, we'll evaluate our options. Mark: We don't have any current plans for marketing individual rewards after the Kickstarter. Morrus: Will players be able to play solo indefinitely, or will they be required to group up to advance? Ryan: No one will be required to group to play. You will find that you'll need to join a PC Settlement to get access to training and character abilities that the NPC Settlements don't offer. Mark: You certainly don't need to group up in order to advance your character. You will probably find that it makes the most sense to journey and find a player settlement you are comfortable in rather than staying in the starter NPC towns. You won't have to join a larger group like a guild to participate in the economy of the player settlement however, even if ultimately your actions are having an impact on the overall community. Morrus: I understand there's an element of player content creation in the game. I have fond memories of Neverwinter Nights - not playing it, but running a little persistent world which I designed myself. How extensive will the content creation element be? If I wanted to create, for example, an EN World 'club' (guild, clan, what-have-you), would I have any tools to designate and/or design an area as such? Ryan: That's a long way down the road. We have some ideas for what we'd like to see, but it will happen after the game is Released and we've succeeded in establishing a growing player community. Mark: To begin with, the biggest impact players will have is in the creation of settlements and deciding what sorts of buildings they want to put there. Later we will add more player-generated content. Morrus: Ryan worked with CCP on Eve Online, and Mark on City of Heroes - two games which I would consider to be very different in terms of MMOs. Do each of you bring something different to the table? Ryan: For my part, I think I bring a sense of direction that I got at CCP. CCP has very clear ideas on why EVE Online was successful and on what the future of MMOs is as an entertainment medium. That insight has shaped my thinking about Pathfinder Online since the day I pitched it to Lisa and Paizo. Mark: I've worked on City of Heroes, City of Villains, Champions, Eve Online, and World of Darkness. I think the biggest benefit I bring to the table is my technical knowledge. I've seen many ways of implementing the basic systems underlying MMO's and I enjoy applying that knowledge to fresh challenges. I also have good experience with smaller teams and how to produce an MMO under a tight budget. Morrus: Why Pathfinder, and why Paizo? Obviously Eve Online (Ryan) is original content, while City of Heroes (Mark) is licensed. The D&D MMO license isn't accessible at present, but there are many other game companies, novel and movie series, comic books, and other properties. What was it about Pathfinder in particular which attracted you? Ryan: I want to work with Lisa again, something we both promised each other we'd do when we left Wizards of the Coast. I think Pathfinder is an ideal fit for the game I want to make: The Pathfinder brand has so much goodwill, such a great community, it comes with a library of interesting magic items, monsters, NPCs, spells and artifacts, it has a library of artwork better than most MMOs use as a reference, and it has the legacy of its game rules that go back to the birth of the tabletop RPG hobby and thus are an anchor through several generations of players. It would be hard to imagine a better fit. Mark: I was very attracted to Pathfinder and Paizo's great community. Paizo has always made it a policy to build their products in conjunction with community feedback, and this is really the best way to make an MMO. We're staying extremely open with the community and making sure their feedback goes right back into the design process, and I think it will make for a better MMO. Morrus: If each of you were to choose one thing about the game which excites you the most, what would that one thing be? Ryan: The ability to found and develop a Settlement, watch as those efforts affect its territory, and engage with the community of people needed to make it thrive. Mark: Making a real impact on the world is the best aspect of a sandbox game. It's difficult to see any effects of actions in most MMO's, but in Pathfinder, we want the world to react to everything the players are doing. It's going to be an exciting journey. ... aren't both LotRO and DDO free to play? Good stuff. Thanks, Morrus, for using our questions. I like what I'm reading about this. 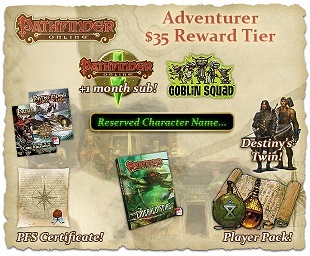 Most everyone I know regards Pathfinder Online as a p2p game. They haven't been clear on their payment model other than the subscription fee and no one I know is even slightly interested in a p2p game. What does it even mean to 'offer microtransactions'? Does that mean it will be f2p or not? For allthe wording, it could be p2p with microtransactions similar to how The Secret World is, or even how World of Warcraft is now with their mounts. They say it's like LotRO and DDO, but how they talk doesn't make that clear as both of them are freemium and not really considered a good payment model.